This page is about the island in Australia. For the island in Canada's Nunavut Territory, see Fraser Island (Nunavut). Fraser Island (K'gari) is a heritage-listed island located along the south-eastern coast of the state of Queensland, Australia. It is approximately 250 kilometres (160 mi) north of the state capital - Brisbane. 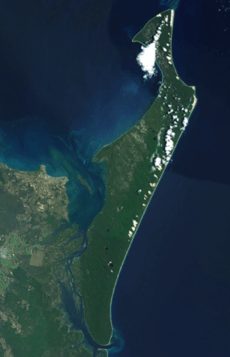 It is a locality within the Fraser Coast local government in the Wide Bay–Burnett region. Its length is about 120 kilometres (75 mi) and its width is approximately 24 kilometres (15 mi). It was inscribed as a World Heritage site in 1992. The island is considered to be the largest sand island in the world at 1,840 km2. It is also Queensland's largest island, Australia's sixth largest island and the largest island on the East Coast of Australia. Fraser Island has been inhabited by humans for as much as 5,000 years. Explorer James Cook sailed by the island in May 1770. Matthew Flinders landed near the most northern point of the island in 1802. For a short period the island was known as Great Sandy Island. The island became known as Fraser due to the stories of a shipwreck survivor named Eliza Fraser. Today the island is a popular tourism destination. Its resident human population was 194 at the 2011 Australian Census. Eli Creek is the largest creek on the east coast of the island with a flow of 80 million litres per day. Eli Creek has its own unique and varied wild life. Coongul Creek on the west coast has a flow rate of four to five million litres per hour. Some of the swamps on the island are fens, particularly near Moon Point. 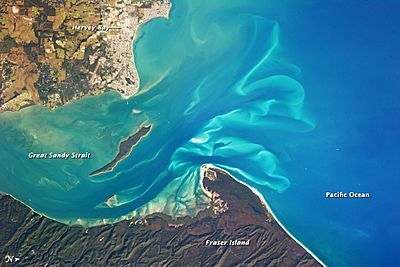 This was only discovered in 1996 when a group of experts who had attended a Ramsar conference in Brisbane flew over the island and conducted an aerial survey. From above they noticed the distinct patterns of potholed peat which are devoid of trees. This was the first instance of fens found in Australia and in a sub-tropical region, although more were subsequently found on the adjacent Cooloola coast. Fraser Island has over 100 freshwater lakes, as well as the second highest concentration of lakes in Australia after Tasmania. The freshwater lakes on Fraser Island are some of the cleanest lakes in the world. A popular tourist area is Lake McKenzie which is located inland from the small town of Eurong. It is a perched lake sitting on top of compact sand and vegetable matter 100 metres (330 ft) above sea level. Lake McKenzie has an area of 150 hectares and is just over 5 metres (16 ft) in depth. The beach sand of Lake McKenzie is nearly pure silica. The lakes have very few nutrients and pH varies, though sunscreen and soaps are a problem as a form of pollution. Freshwater on the island may become stained by organic acids found in decaying vegetation. Because of the organic acids a pH level of 3.7 has been measured in some of the island's perched lakes. The high acidity levels prevent many species from finding habitat in the lakes. Another perched lake on the island is Lake Boomanjin, which at 200 hectares in size, is the largest perched lake in the world. In total there are 40 perched lakes on the island, half of all known lakes of this kind on the planet. 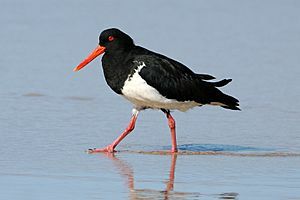 Lake Boomanjin is fed by two creeks that pass through a wallum swamp where it collects tannins which tint the water red. Lake Wabby is the deepest lake on the island, at 12 metres (39 ft) in depth and also the least acidic which means it has the most aquatic life of all the lakes. Fraser Islands climate is generally mild and is not subject to extremes in temperature due to the moderating influence of the ocean. Temperatures rarely rise above 35 °C (95 °F) or drop below 5 °C (41 °F) and humidity is consistently high. Rainfall is heaviest during the summer and early autumn, and the annual average is 1,271 mm (50.04 in). 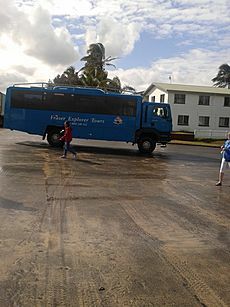 Cyclones can be a threat; Cyclone Hamish brushed the island as a category 5 in March 2009, while Cyclone Oswald in January 2013 was significantly weaker at a Category 1. Both storms however caused severe beach erosion, particularly on the islands northern tip. Saltwater crocodiles are exclusively tropical reptiles and usually found in Far North Queensland (several hundred kilometres north-west of Fraser Island,) however, occasionally during the warmer season (December through March, when water temperatures reach consistent tropical temperatures) crocodiles may appear in areas in and around Fraser Island. During the 2008–2009 summer several crocodiles (one over 4 metres in length) were present in the surrounding ocean. It is thought that these reptiles are seasonal visitors, as they always disappear during the cold months (presumably returning to tropical northern Queensland.) This sort of activity was apparently reported but unverified decades ago (a handful of crocodiles have also historically been observed on very rare occurrences around Brisbane, the Gold Coast and Sunshine Coasts during the warmer season) but within recent years has been proven and observed more often. Crocodiles do not breed nor do they appear to have any permanent populations living on Fraser Island. The earliest known name of the island is 'K'gari' in the Butchulla people's language (pronounced 'Gurri'). It means paradise. 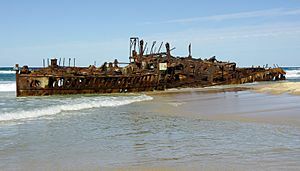 The name Fraser Island comes from Eliza Fraser and her story of survival from a shipwreck on the island. Captain James Fraser and his wife, Eliza Fraser, were shipwrecked on the island in 1836. Their ship, the Stirling Castle, set sail from Sydney to Singapore with 18 crew and passengers. The ship was holed on coral while travelling through the Great Barrier Reef north of the island. Transferring to two lifeboats, the crew set a course south, attempting to reach the settlement at Moreton (now Brisbane). During this trip in the lifeboats, Captain Fraser's pregnant wife gave birth in the leaking lifeboat. The infant died soon after birth. The Captain's lifeboat was becoming more and more unseaworthy and was soon left behind by the other lifeboat which continued on. The sinking boat and its crew was beached on what was then known as the Great Sandy Island. Whether the survivors died due to disease, hunger, exhaustion or battles with the native population will never be known for sure; most likely a little of all of the above. Captain Fraser died leaving Eliza living among the local peoples. She was rescued 6 weeks after being shipwrecked by a convict, John Graham, who had lived in the bush as an escapee, and who spoke the Aboriginal language. He was sent from the settlement at Moreton by the authorities there who had heard about Eliza's plight, and negotiated her return. Within 6 months, Eliza had married another sea captain. She moved to England and became a sideshow attraction in Hyde Park telling ever more lurid tales about her experiences. She was killed in a carriage accident in Melbourne in 1858 during a visit. Archaeological research and evidence shows that Aboriginal Australians occupied Fraser Island at least 5,000 years ago. There was a permanent population of 400–600 that grew to 2,000–3,000 in the winter months due to abundant seafood resources. The arrival of European settlers in the area was an overwhelming disaster for the Badtjala people. European settlement in the 1840s overwhelmed the Aboriginal lifestyle with weapons, disease and lack of food. By the year 1890, Aboriginal numbers had been reduced to only 300 people. Most of the remaining Aborigines, the Badtjala tribe, left the island in 1904 as they were relocated to missions in Yarrabah and Durundur, Queensland. It is estimated that up to 500 indigenous archaeological sites are located on the island. Initial European contact was limited to explorers and shipwrecks. 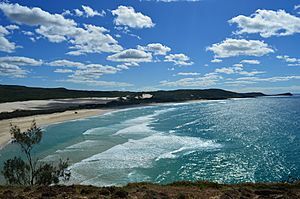 The first recorded European to sight Fraser Island was James Cook who passed along the coast of the island between 18 and 20 May 1770. 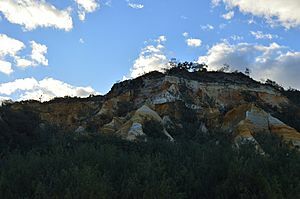 He named Indian Head after viewing a number of Aboriginal people gathered on the headland. After Cook's passage the Aboriginals composed a song to commemorate the event. This was later recognized as the first preserved oral testimony of indigenous observation of Europeans. 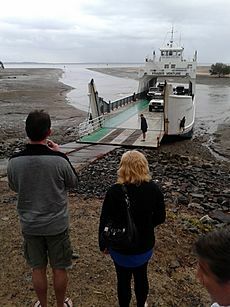 Matthew Flinders sailed past the island in 1799, and again in 1802, this time landing at Sandy Cape, while charting Hervey Bay. His 1814 chart is a combination of both voyages, but did not confirm Fraser Island as being separate from the mainland. However, Flinders did suggest the presence of shallow swampy areas at the lower part of the bay. 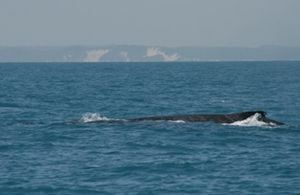 Flinders was told of an opening at Hook Point, between Fraser Island and the mainland, by two American whalers who were hunting whales in Hervey Bay. In 1842, Andrew Petrie discovered good pastoral lands and forests, attracting graziers to the island. Lieutenant Robert Dayman was the first European to sail between Fraser Island and the mainland in 1847. Logging on the island began in 1863, initiated by American Jack Piggott (known as 'Yankee Jack'). 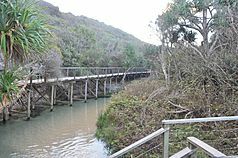 Blackbutt trees (Eucalyptus pilularis), Queensland kauri (Agathis robusta) and satinay or Fraser Island turpentine (Syncarpia hillii) were extensively exploited as they provided excellent timber. Satinay logs were sent to Egypt to be used in the construction of the Suez Canal. For the first 70 years of logging, bullock drays were used to haul the timber to loading points on the beach. Railway tracks were laid through the forest to facilitate logging, but were later removed. 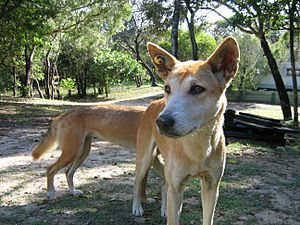 The logging industry continued until 1991, ceasing following concerns raised by the Commission of Inquiry into the Conservation, Management and Use of Fraser Island and the Great Sandy Region, appointed by the Goss Labor government and chaired by Justice Tony Fitzgerald. As part of ongoing meetings in the United Nations Trusteeship Council on the Conditions in the Trust Territories, the Republic of Nauru expressed concern that its phosphate mining exportation would be depleted by the end of the century, endangering the future of the island. In 1961, Fraser Island was proposed by Australia as a location for the resettlement of the entire population of the Republic of Nauru. 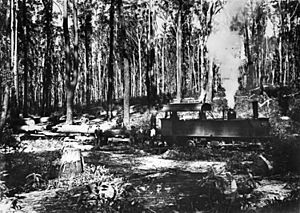 The timber industry on Fraser Island managed to ensure that resettlement on Fraser Island did not proceed. In 1964 in the 31st session of United Nations Trusteeship Council meetings it was concluded that Curtis Island could provide a more satisfactory resettlement for the population of Nauru. Nauru rejected the offer of moving the entire population to Curtis Island due to political independence considerations that Australia would not agree to. Although a resettlement never did occur, the Republic of Nauru went on to achieve independence on 31 January 1968. Fraser Island Facts for Kids. Kiddle Encyclopedia.